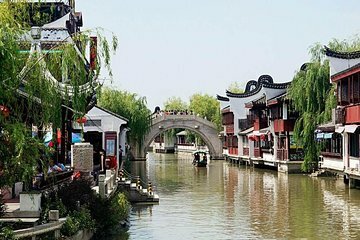 Head to the town of Zhaojialou just outside Shanghai’s city center and explore a real Chinese water village on this half-day private tour. Discover the origins of Shanghai agriculture and learn about the history and culture of this ancient town. Sit down to a delicious lunch or early dinner and take a relaxing boat ride along the canals to get a different perspective of the town. Alana was amazing, arrived on time and was very detailed when explaining how the tour would work. The transport was very spacious and clean with water provided. The tour of the village was great and she even showed us some secret viewing spots, along with helping us decipher the lunch menu for our tastes. We would definitely recommend the tour to anyone with 5 hours or so to spare as it gets you away from the hustle and bustle of Shanghai to a peaceful town where even the locals go to relax. Thanks Alana.